Puzzle Corner - Prizes galore with Charles' puzzles. Literary Trail - The solution and winner revealed. Bee On The Comb - Win a copy of Kit Williams' book. Bulletin Board - All the latest news and clues from Simon. Pastimes - Brian brings us more from the archives. Mystery Musical Tour - The first clue in a year long hunt from Ann & Sandra. A Logical Christmas - Club members tackle the annual brain teaser. Post Bag - Your letters to Kitwillie. 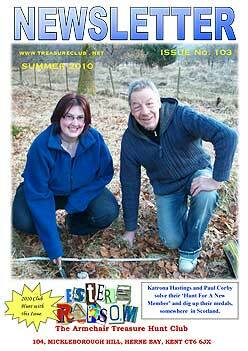 Cover Photo: Katrona Hastings and Paul Corby solve their Hunt For A New Member and dig up their medals, somewhere in Scotland. Puzzle Corner - Andy takes over the mantle and gives you several chances to win a cash prize with his brain teasers. Three Letter Hunt - The solution and story of this hunt. 2010 Club Hunt Preview - Craig introduces this year's hunt. Well Red! - Pete tells us how he solved the clues to Ann & Sandra's Literary Trail. Club Meeting - Make a date in your diary. Esme's Catalogue - A very special little mouse is introduced. Hunt For A New Member - More success stories from our new member's hunts. 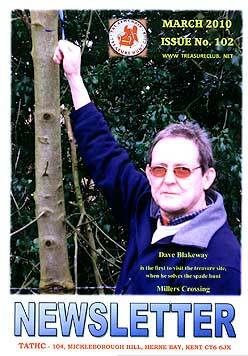 Millers Crossing - Another spade hunt has had all of it's treasure claimed. Musical Mystery Hunt - The next track in our musical hunt by Ann & Sandra. 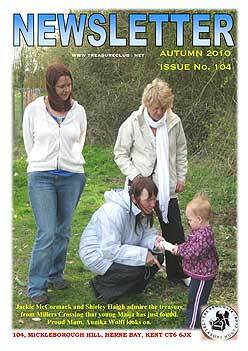 Cover Photo: Jackie McCormack and Shirley Haigh admire the treasure from Millers Crossing that young Maija has just found. Proud Mum, Annika Wolff looks on. Club Meeting - Simon Jacobs gives us all the details for a great spooky treasure hunting experience. Puzzle Corner - Andy gives you three chances to win real money with his brain teasers. The Tenth Leaf - Janet tells the background story to her exciting new web hunt. The Fly - Brian gives us all the clues to catch the two red herrings. Hunt for a New Member - John & Keith Elliott solve ’Round Britain Quiz’. Grandad’s Final Challenge - The solution and story of Frank Eastham’s charity hunt. 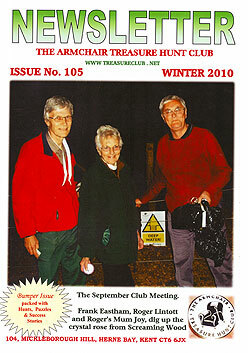 Cover Photo: The September Club Meeting. Frank Eastham, Roger Lintott and Roger's Mum Joy dig up the crystal rose from Screaming Wood. Three Letter Hunt - Helen sets the latest hunt in this very popular series. Club Meeting - All the fun and games from the meeting in Pluckley, organised by Simon & Martyn. Hunt for a new member - Beryl and Paul solve the Yorkshire hunt. Puzzle Pages - Andy adds a seasonal flavour to his puzzles. Second Time Around - Pete and Frank tell us how they solved this long running club hunt. Ester’s Ransom - Matt gives us his account of how he and Paul solved this year’s club hunt. The Pinboard - Matt & Nick give us the solution to both the Totnes and Anston treasures. The Fly - The story of how the Golden Spade and Red Herrings were solved. The Pinboard - The winners of the Totnes and Anston treasures tell their story. Musical Mystery Hunt - The last tracks on their musical hunt, by Ann & Sandra.